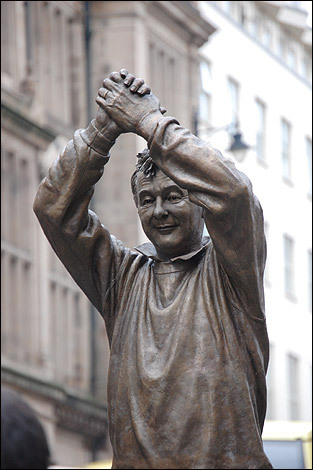 Charity update from Clough Statue miniatures.. | Through the seasons before us..
Charity update from Clough Statue miniatures..
Nottingham’s bronze statue of the legendary football manager Brian Clough has helped to raise thousands of pounds for good causes. The sale of hundreds of miniature replica statues of the Master Manager has raised £20,000 for the Brian Clough Memorial Fund, which is run by his family and gives money to the types of charitable causes he supported. A cheque will be officially presented to the Clough family on Tuesday July 28th at 5pm, next to the original bronze statue in Nottingham city centre. The limited edition miniature figures, made from resin, were designed by Les Johnson, the world-renowned sculptor who made the impressive nine-feet high bronze statue which was unveiled by Mrs Barbara Clough in Nottingham last November. That statue, costing £70,000, was paid for by fans who set-up a fund raising campaign, smashing through their target in just 18 months. Following the unveiling of the statue, the miniature figures were put on sale for £100 each. Almost 1,000 have been sold. After artist and production costs are taken into account, all profits are going to the family’s memorial fund. The sale of the replicas was managed by the Nottingham-based firm The Media Group. There are just 30 replicas left. They can be ordered at http://www.themediagroup.tv/brianclough. The chairman of the Brian Clough Statue Fund (which raised the money for the original life-size bronze statue), Paul Ellis, said: “I’m absolutely delighted that the miniature statues have raised so much money for charity. It’s fitting that the proceeds are going to the family’s memorial fund. It goes to show that the memory of Brian Clough can still help good causes, just as he did when he was alive. Nice one nffc im away in texas working at mo my old man bought me 150 BC stories its a cracking read have you had a swatch at it .